Sony's "Vote to Play" system returns this month to ask all PS Plus members "what should be one of the free games offered in March?" The three games up for your selection include two solid co-op titles: Assault Android Cactus and Broforce. I won't lie, that's a tough choice. Here's a quick breakdown of both titles. 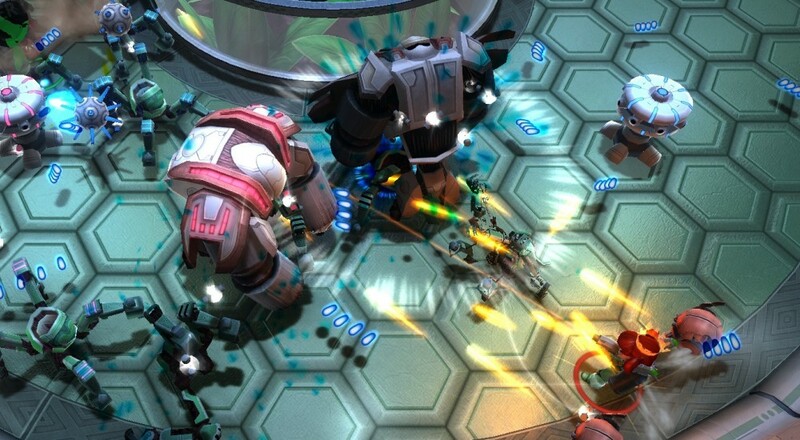 Assault Android Cactus is a fantastic twin-stick shooter where you and up to three of your friends (locally) control robots to fight your way through a ship that's been taken over by a rogue A.I. Each character has her own unique primary and alternate weapons, and teaming up with friends allows for a lot of crazy combinations. Something new for the PlayStation 4 version of the game is that it will support the Shareplay feature, meaning you can pull in a remote friend to take over one of the local co-op spots for an hour at a time. Broforce is... well, Broforce; an action platformer with a roster of "bros" that are all taken from classic action films. Run and gun your way through the game's 15+ levels as you battle communism, aliens, hellish hordes, and untimely deaths due to the proliferation of explosions. Online and local play is support for up to four players. The third game, Action Henk!, is a competitive racer that looks like one of those fun titles to play with friends, but it definitely is not cooperative. You can cast your vote for which title should be free in March starting February 9 (next Tuesday). The voting system is accessed via the PlayStation Store on the PS4 under the "PlayStation Plus" section. Page created in 0.3800 seconds.